Marjorie Guymon of Goldsmith & Guymon, P.C. Marjorie Guymon received her bachelor’s degree from Weber State University and hAward er Juris Doctorate from the J. Reuben Clark Law School at Brigham Young University. While in law school, Marjorie received the highest grade in her bankruptcy class. This interest in bankruptcy has led her to where she is today. She is currently with the firm Goldsmith and Guymon and primarily practices bankruptcy, business law, estate planning, family law, guardianship, probate and trust administration. Marjorie first became involved with pro bono service when she and her partner, Dara Goldsmith, formed their firm. Dara was very involved with the legal community and introduced Marjorie to pro bono service. 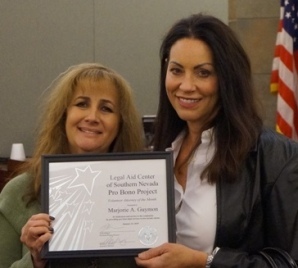 For her commitment to pro bono, we honor Marjorie Guymon as our January Volunteer of the Month.